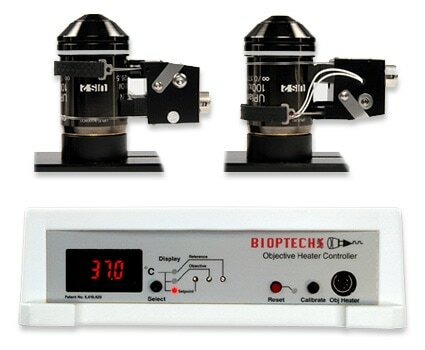 To eliminate this thermal gradient, Bioptechs offers a patented Objective Heater® System which includes a heater/sensor and an electronic controller. The heater/sensor is comprised of an adjustable thin-film heating band which surrounds 3/4 of the diameter of the upper region of the central retracting tube of the objective. A surface probe thermal sensor positioned in the gap formed between the ends of the heating band measures the temperature of the objective. 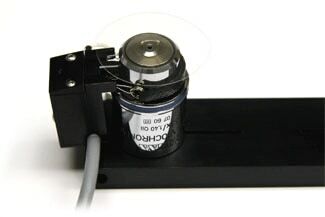 This heater/sensor assembly is supported on an adjustable metal mounting to fit objectives ranging from 17 to 35mm in diameter. The heater loop requires a minimum of 3.5 to 6mm longitudinal, physical contact with the cylindrical objective surface depending on which objective heater is required. In some cases there may be a decorative collar on the objective that must be removed in order to permit adequate surface contact. Depending on the objective, it may be necessary to invert the objective heater and mount the objective upside down for optimal thermal transfer to the lens of the objective. It may also be necessary to isolate the objective from the nosepiece turret for proper objective temperature regulation. Additional options are available for your objective which can help you heat the objective more efficiently, or perhaps if you would like to cool the objective that option is also available. The Controller is specifically designed to slowly heat the objective over a fifteen minute warm-up period then hold the objective at the set point value within 0.2 degrees C. The Controller operates from ambient to 50 degrees C and has special safety circuitry which utilizes a 0.9 degrees C error window to shut down the controller and sound an alarm if, for any reason, the temperature of the objective deviates after it has reached set point. A user calibration test is also built in to the controller. You can send your objective into Bioptechs to have it sized, photographed and thermally profiled. Although there have been no studies relative to the effects of thermal cycling of objectives between ambient and 37 degrees C, Bioptechs recommends storing the warmed objectives in a constant temperature enclosure when not in use. The Boekel desktop incubator is well suited for this application as well as a convenient place for temporary storage of specimens or media near your microscope. When using the Bioptechs Objective Heater, Cargille type 37 Immersion oil is highly recommended to optimize the objective’s PSF.